It is midmorning and the summer heat of the Turkish sun beats into the porthole of our cabin. My husband and I wake up feeling like we are stones being thrown by a little boy, ‘skipped’ along otherwise peaceful waters. The twenty-seven meter Gulet, a traditional two-masted wooden sailing vessel, moves through the cerulean waters of the Aegean Sea with a jarring ease. Although gullets are traditional sailing vessels, we awaken to an offensive smell of diesel fuel percolating into our cabin from the roaring engines below. The captain’s ambitious itinerary prevents us from exclusively sailing and the engines are used more often than not. We hurriedly put on our bathing suits, they’re all we’ve been wearing for the past five days, and escape the lingering fumes. 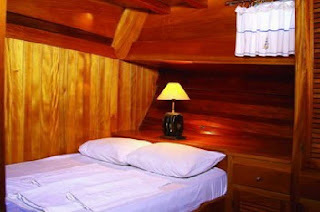 We plop ourselves down on the comfy terrycloth-covered benches located on deck at the stern of the ship. We lounge with strong Turkish coffees, sweetened with sugar, as the gulet pulls into an isolated bay. The lush forest descends onto the rocky shoreline of the Gulf of Güllük. The sound of goat’s bells in the distance mix with the sounds of our boat; robustly laughing Germans; the crew’s Turkish pop music; the first mate, Soner, singing off key; the cook, Ali, in the galley banging pots and pans, preparing our breakfast. We jump off the deck into the sea. The water is shocking at first and sends a zing of chill throughout my body. Once all my goose bumps go away, the cool water is pleasant and refreshing on this hot summer day. My husband begins swimming towards the shore that is approximately 500 hundred feet away from the anchored gulet. I follow him, exploring the surroundings, as I doggie paddle in the clear sea. We reach the sandy beach nestled along a cozy pine forest. The rocky shoreline is home to thousands of sea urchins; their black quilly bodies dot the shallow waters. All of the sudden the gulet begins to take up anchor. My husband and I look at each other and panic as I yell, ‘they’ve forgotten us! Swim!’ We both realize the danger of being left behind. We had just seen the film Open Water where a couple was accidentally abandoned during a diving trip in Australia. To a terribly melancholic soundtrack, they both perished from shark attacks. Although not in Australia, or in the open water, I’m not prepared for the slightly less dramatic Turkish sequel. We launch ourselves back into the water and begin navigating the shallow shoreline. I trip on a rock, jetting out from the water, and use my left hand to break my fall into a cluster of over one hundred sea urchins. The sharp quills penetrate my flesh, though the fear of being abandoned on a desolate beach dulls the pain. We frantically propel ourselves toward the gulet as the salty sea water enters my wound and aggravates the sting. We reach the gulet and board the boat at once. Our panicked faces alarm the other passengers and Elisabeth, an older German passenger asks in a strong German accent, ‘vatts vrong?’ ‘We were nearly abandoned’, I exclaim! ‘The anchor just came up! Why didn’t Captain warn us that we would be leaving soon?! ?’ Elisabeth chuckles and says, ‘Captain is just readjusting da anchor, he says vee stay here all day’. The crew and passengers laugh at our expense and then one by one carry about their business. As the shock of our blunder wares off, a terrible pain shoots through my hand and arm. I look down and see long spiny sea urchin quills poking out from the palm of my hand. Soner, the first mate, also sees the quills. He approaches me and says in a serious tone and strong Turkish accent, ‘this is not good’. Soner alerts the captain who had been not only adjusting the anchor, but also working in the ship’s engine room. His hands are covered in black grease so thick it looks as though he is wearing black gloves. Captain rants off something in Turkish to Soner, who runs and returns with the first aid kit. The captain stands over me and Soner, directing him, in Turkish, the way a hospital attending doctor would lecture a resident. Soner uses a hypodermic needle and begins cutting my flesh with the needle point to dislodge the ten long black quills. The pain is borderline unbearable and as I clinch my teeth Soner says, ‘no move’. The captain is becoming increasingly dissatisfied with his first mate’s performance and harshly criticizes Soner’s procedure. After a frustrated outburst in Turkish, he slaps his greasy hands into latex gloves and continues the operation himself. He pulls the quills out one by one, cutting my skin with the point of the hypodermic needle to remove each and every quill. Finally, he dabs my wounds with iodine and the sting makes me hiss with pain. After the ‘operation’ Soner and Captain pat each other proudly on the back and dote on me, the patient. It’s hard to believe I’ve just been crudely but successfully operated on in the middle of the Aegean Sea by two sailors with the benevolence and composure of surgeons. The pair seemed but a skipper and his first mate just days before. ‘Captain’ was middle aged and had over twenty years experience sailing the seas. He smiled with his eyes and with his reassuring demeanor, had an extraordinary ability to make the passengers of his vessel feel safe. Soner, the first mate, was in his early twenties and a Casanova of the sea. He flirted with all the female passengers which sent pulses racing. He befriended the male passengers and made everyone feel like old chums. Ali, the cook, at first was a bit quiet as his mind seemed distant, near his wife and soon-to-be born son in Cappadocia. He made beautiful, fresh, and authentic Turkish cuisine aboard the gulet and talked of how he learned to make the dishes from his wife, who learned from her mother, who learned from her mother. ‘Junior’ was the deckhand and just turned sixteen. Our voyage with ‘Junior’ was the first time he had ever slept away from his parent’s house. He was eager, enthusiastic, but I couldn’t help sensing he was a bit homesick. The crew of strangers would soon become the force behind our unforgettable vacation experience. Five days ago we boarded the gulet and wished to drop off our luggage so we could explore Bodrum, the port city from which we would depart. We were the first of twelve passengers to board the ship and had our first choice of cabin. It would later occur to us that the cabin we chose was right above the output for the engine exhaust. Hindsight is 20/20 right? We left our belongings in the cabin, which had no lock, and enquired about the security on the boat. Soner replied in broken English, ‘Do not worry, you are nothing’. My husband and I looked at each other and chuckled as we understood his mistake. There was nothing to worry about, Soner and ‘Junior’ would be aboard and would look after our luggage. Although we understood his mistake, it was humbling. Laughing, we agreed, he’s right…who’s gonna want our junk? We decided to explore Bodrum before we embarked on our ‘Blue Cruise’ around the Aegean. We ate lunch at a café in city centre alongside the narrow Cumhurriyet Caddesi (Republic Street), the main artery of Bodrum, a port town on the Aegean coast of Turkey. I ordered an iskender kebap. The sizzling lamb meat was shaved off the spit in front of us onto thinly sliced, freshly grilled pita bread covered with a spiced tomato sauce, strained yoghurt and fresh boiling butter. The café sat alongside the sea with breathtaking views of sea. The seascape was picturesque and the food was delicious but the cackling cooks in the open kitchen are what I most vividly remember about this meal. They laughed energetically, shouting to each other over the sound of banging pots and pans and clinking kitchen utensils. I would soon discover, thanks to the gulet crew, that in addition to Turkey’s beauty, scrumptious cuisine, and fascinating history and culture, the Turks are a friendly people with a zest for life, a keen sense of humour and a sincere love of laughter. After lunch and a browse about town we returned to the gulet to meet the other passengers; a couple from Scotland, two couples from Germany, an English man, and a couple from Istanul. Everyone was friendly and jovial, excited to begin our journey. The first night on board, the wine and beer was flowing. Everyone was having a great time getting to know each other. Soner exclaimed, ‘Raki time!’ and passed out glasses filled with a shot of Raki, the anise flavoured Turkish liquor, similar to Ouzo, and other Mediterranean varieties. He came around with a water pitcher and filled the glasses to the brim changing the clear liquor to a milky white colour. We all raised our glasses and said, ‘şerefe!’ (cheers in Turkish). Soner then turned on the stereo and like a clown began obnoxiously dancing for our amusement. The song ‘I Just Called to Say I Love You’ by Stevie Wonder came on and he enthusiastically sang the lyrics pointing at me to help him serenade the rest of the group. He’d sing, ‘I just called to say I love you’ and he’d point at me and I’d sing, ‘and I mean it from the bottom of my heart’. The other passengers were in stitches, laughing, and joined us in singing the old song that penetrated each of our cultures and age groups. Throughout the trip the crew, especially Soner, was intent on teaching me Turkish. I have a sincere interest in learning foreign languages and jumped at the chance to pick up some Turkish from native speakers. After a couple days the crew requested that I try only speaking to the four of them in Turkish, which at first limited my conversations. However, after a day or two I was really picking up the language as a result of pure immersion. I’d slip and order a glass of red wine in English and Soner would look at me in confusion and say, ‘why you speak English? You are Turkish, no? Speak Turkish’. Though American through and through, his vote of confidence was encouraging. I was learning Turkish but Soner wasn’t getting much better at English. This ladies’ man was however, very familiar with ‘I Love You’ in five languages as he displayed to the group as if a party trick. He couldn’t quite manage to say my name correctly though. Bethany was ‘Brittany’ by default as the ‘th’ doesn’t jive with the Turkish tongue. Beth was ‘Biff’ so; I obviously opted for ‘Brittany’. ‘Brittany’, Soner would yell across the twenty-seven meter gulet ship to get my attention and the attention of the others. ‘I just called…. to say I love you!’ I’d sing back, ‘and I mean it…. from the bottom of my heart’. The other passengers including my husband found our constant serenade to them hilarious and we received many requests throughout the week to sing good ol’ Stevie Wonder again and again. Not only was Soner a fan of serenading the passengers, he liked to serve our meals on empty serving trays and plates with no silverware. ‘Afiyet Olsun’ (Turkish for enjoy your meal) he’d say as we’d laugh pretending to eat our non-existent meal. He also liked to pick people, up in their chairs, and carry them around the deck at mealtimes. He would throw each of us into the sea- that was pretty much a daily occurrence. One day we all left the gulet and took a walk through Soner’s tiny and remote coastal village. He jokingly tried to convince us to sample ‘a Turkish specialty’; a sour, unripe, unidentifiable fruit- luckily everyone knew better. Soner would disappear and return with flowers for all the women of our group…what a flirt! It was a pleasure to be in the crew’s company. It was delightful to see how good they were at their jobs and how much they enjoyed their time at sea. Our week had ended and my husband and I had to depart before any of the other passengers in order to catch our flight back to Istanbul. We off-loaded our luggage onto the land and turned around to say goodbye to the crew and the other passengers. As we turned toward the group, they stood at the stern of the ship waving tissues in unison as if in an old movie, bidding friends goodbye before a long voyage. It was really touching and down right hilarious. Our trip was a precious glimpse at Turkey, the local customs, authentic food, and most importantly it was a privileged look of the true sense of the Turkish spirit- intensely proud, enthusiastically helpful, curious and open-minded to the world around, and keen to laugh whenever possible. Not only do the fragments of urchin quills still remain in my hand but the lingering laughter of the Richmond III crew and passengers etch the unforgettable boating experience in my memory forever. beautiful picture, i hope you enjoyed lots on the curies. I enjoyed to here about your parties and games on the gulet. Thanks for shearing your experience. Floating journey is a good option for turkey trip. I have traveled to over 60 countries on 6 continents and recently achieved my goal to fill an entire passport with stamps! As a freelance travel writer, I share my trips in hopes of inspiring others to explore this magnificent world. I travel to distant places to better understand the interconnectedness of today’s world and how our nation fits in as a political act. I delight in good-valued accommodation, great art, adventure, and tasty local cuisine. This blog is an ode to the feeling of your head hitting the pillow in a faraway land, drifting into dreams about what you’ll discover next. Bon Voyage! Screaming Baby in Seat 28C!